As fast fashion continues unabated, questions need to be asked: who is responsible for regulating the industry? Is it the companies themselves who are now facing a time of uncertainty, unable to squeeze margins much more than they already have and now require a new way to be profitable? Or is it the consumer? Firms will always state that thy provide what customers want but are customers always aware of the implications of their actions or do they just believe that companies are already behaving in the ”correct” manner? Or does this problem require legislative measures that will force both firms and customers alike to behave in a different way? This paper seeks to answer some of these questions. Between 2002 and 2006, there was a 33%increase in the amount of clothing bought in the UK (Siegle, 2011) (Ethical Fashion Forum). The average person goes through about 35kg of textiles a year, most of which is clothing and is thrown away within a year of purchase. 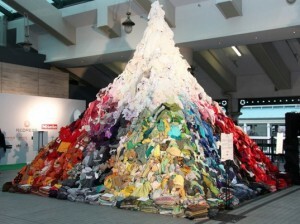 In 2005 this resulted in 1.2 million tonnes of clothing going to landfill (Siegle, 2008). The UK has legislation regarding the disposal of electric waste items forcing companies to take responsibility for the waste caused by the sale of electronic goods and there is no reason why this could not also apply to fashion retailers (Environment Agency, 2007). Value retailers sell their clothing cheaply usually stating that economies of scale allow consumers to benefit from lower prices. What such companies are less quick to divulge is that the fast fashion trend has also led to lower standards both in the quality of materials used and also in the quality of the finished product (Siegle, 2008). As consumers, they are happy to accept low prices paid for goods but know nothing of the value of those goods (Crewe, 2008). Another issue is the lack of diversity of materials used in fashion with cotton and polyester dominating the market, providing about 80% of the global textile market (Fletcher, 2009). Increasing global shocks, however, have not led to an increased diversification of resource materials. Firms seem reluctant or unable to innovate. In a wider context, the lack of diversity has ramifications far beyond fashion into the integrity of ecosystems and livelihoods of people living in producing and supplier countries. Faced with increasing pressure on resources caused by a rise in global demand, combined with factors related to climate change, fashion companies are adapting their operations, increasingly taking environmental and social impacts into consideration. To reach that point, fashion will have to directly confront issues long ignored. While existing literature points towards ethical or environmental issues, a holistic approach to issues is needed if companies are to adapt for the future.